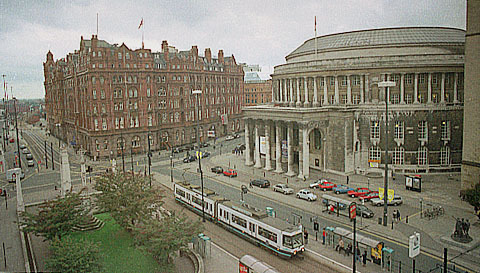 St Peter's Square with the Midland Hotel, Central Library, War Memorial and Metrolink stop. The controversial plan to build a high-rise hotel on top of the Free Trade Hall has been made the subject of a public enquiry, to the delight of opponents of the scheme, including the Manchester Civic Society, and other heritage groups. But the Leader of Manchester City Council, Councillor Richard Leese, was angry at the decision, and criticised the Civic Society, calling them "historical hysterics". The hotel block will rise 19 storeys (reduced from 21) above street level, and is set back and at an angle to the Free Trade Hall facade. Traditionalists point to the gross incongruity of the plan, with a rectangular glass & steel slab sitting awkwardly on top of the historic Venetian style facade. But those in favour of the development say that the design successfully incorporates the facade into the design, and is the result of years of work trying to find a new use for the building. The plan has been approved, but may now, its supporters say, be put in jeopardy by the inquiry. The Free Trade Hall was gutted in the blitz, and lay derelict - see last week's Manchester Eyewitness 1947 - until it was reopened in 1951. It was the home of the Halle Orchestra until the opening of the Bridgewater Hall last year. Another familiar face from the Labour dominated Town Hall, Councillor Pat Karney, who was reported to have called the Civic Society "a bunch of middle-class tossers*" (*not the original word used), made peace with another former adversary today, the owners of the Trafford Centre. He agreed on behalf of the Council to co-operate with the gigantic new shopping mall, which is nearing completion in Trafford Park. The Council had originally opposed the building of the Trafford Centre as they claimed it would damage city centre trade. Now they have agreed to work together with owners Peel Holdings, who also own the Manchester Ship Canal and Liverpool Airport. The whole of the "Ship Canal corridor" will be developed, and a Metrolink line to the new shopping centre is planned. Imaginative new brick houses and apartment buildings have transformed Hulme from a late 60's concrete jungle to a symbol of 90's inner city regeneration. Rolls Royce is synonymous with British quality in automotive engineering, and it was in Hulme, Manchester, that Henry Royce first started to build his famous cars - a road there commemorates his name. In 1946, a new factory was opened in Crewe, 35 miles south of Manchester, but now the celebrated company is up for sale. It appears that the Best of British is to be sold to the Germans - either BMW or Mercedes. Some may lament the sale of the last major British car manufacturer - only specialists TVR near Blackpool and Morgan in Wales are still independent - to a bunch of foreigners, but BMW are reportedly keen to maintain its British character and high standards. The Manchester Evening News (check the latest on their website at Manchester Online) was given away free today courtesy of the cut-price Luton-based airline EasyJet, who are inaugrating two new flights to the continent - but the flights won't be from Manchester. Due to lower landing fees, the company opted to fly from Liverpool. A one-way, no-frills flight to Nice will cost you £39, and to Amsterdam £35, plus £10 airport tax. By co-incidence, Air UK, owned by KLM, started a new route from Manchester to London City Airport today. The service is targeted at high-flying executives, and provides a direct link to the City of London from Manchester. New electric trains are to start operating to Hadfield and Glossop from Piccadilly. The Woodhead Tunnel, beyond Hadfield, may be re-opened for use by freight trains. See below. Police announced on Saturday that the body of a boy had been found on the edge of Willow Grove cemetery in Reddish, and that they thought that the remains are those of Jamie Lavis, missing for over six months. Last week, bus driver Darren Vickers, from Stockport, was charged with the abduction (but not the murder) of the child. The face, and slightly Americanised voice of Louise Woodward, from the Cheshire village of Elton, 30 miles down the M56 from Manchester, has been seen on screens all over Britain this week, as she pleads her innocence of the murder of baby Matthew Eappen at the trial currently in progress in Boston. People from her home village, watching non-stop TV coverage of the trial, have shown great solidarity with her, and fully expect Louise to be back home on Saturday, acquitted of the murder charges. I do to. Railway tunnels unused since the 1960's may be reopened in order to move freight from the motorways to the railways. Railtrack, the company which owns Britain's railway lines is studying a plan to re-use the Woodhead Tunnel on the old Manchester to Sheffield line, or the Standege Tunnel between Greenfield and Marsden. It would be good news for the railways, and for regular users, like me, of the M62 (right), if all that heavy freight could be shifted onto trains. It was just over fifty years ago that the decision was taken to electrify the Woodhead Tunnel - see Manchester Eyewitness August 23rd 1947. Next week, brand new electric trains will start operating on the Glossop/Hadfield line. And Manchester's direct rail link with Paris via that other, more famous tunnel will be starting up soon. Recently I saw a blue and yellow Eurostar train on a test run near Ardwick. Look out for a picture soon on this page. The weather this week has been mostly bright and sunny, but cold. Not as cold as in Denver, Colorado, featured on page 6 of today's Evening News. A picture of a fallen tree, a car and lots of snow is evidence of Denver's worst snowstorm for 30 years. It won't be long before snow - a light sprinkling, I expect - will be falling on Manchester, but in the meantime, the next few days will be sunny, but windy. Nighttime temperatures are likely to fall nearly to freezing point, and in the day, the temperatures should be in the high 40's fahrenheit, or around 10 celsius. The clocks went back yesterday, so Manchester's late afternoons are suddenly much darker - an air of Christmas is beginning to appear and there are fireworks going off at night - Bonfire Night is a week on Wednesday - I'm looking forward to sparklers and toffee.